Colour compositions as musical notation. Shapes formed into phrases for complex prose. Patterns beating out rhythms of discord and melody in equal measure. For painting / sculpture / floor work / wall work Renee Cosgrave has curated an orchestral ensemble of visual harmonies and irregular syncopation. There is something captivatingly aural about this show – like music for the eyes. It is code too. Cued hints that imply meaning but withhold content. Morse code tapped out in coloured wax, enamel triangles and concrete asterisks. It is also the simple vibrationary enjoyment of material, shape and tone. Soft beeswax sits atop the hardened surface of wood panel. Watery drips of liquid paint caress hard-edged cold metal. Coloured shapes hug architectural space. The individual artists of this show declare their own voices clearly and with intent. Those voices rise and fall, blending across the space in couplets and trios. Cross-pollinating and cross-referencing. There is a cohesion even while there is an abundance. Merryn’s work talks to Caleb’s while Esther’s engages Fiona’s. Then someone mentions flow and they all start talking to Nick’s. The triangles break free to discuss variation only to quieten down as Johanna’s deflated ball reveals the weight of Caleb’s materials to the onlooking concerns of Renee’s detritus paint scrapes. These works are the material traces of dedicated artists doggedly pursuing an uncertain expression. They speak in tongues and they cannot restrain their energies. You can feel that spark of urgency in the room. Electrical circuits engineered into segmented fractions. Transistors modifying current. There is no such thing as objects, only relations. Objects are manifestations of relationships. It is the energy charge between the colour orange and the colour blue that brings the tarpaulin and the timber into the world. At the centre of the room is where you will feel the art working. And it will be you that the artwork will make manifest in that space. Art does work, after all. At least good art does. Which is why we call it artwork. 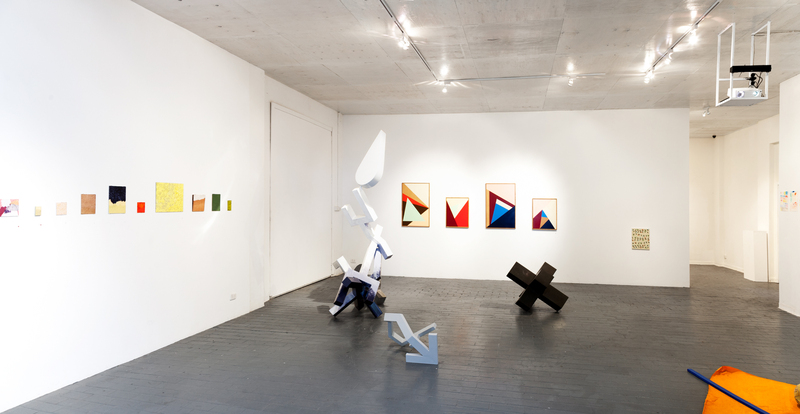 What is most exciting about a show like this is that you are free to read the language of abstraction as you see fit. Your personal history, your personal tastes and your own mood at this particular moment will arm you with the necessary equipment to enjoy, discard or be perplexed by the work. If you’re willing, you can allow the work to wriggle its sub-audible tones into your body. It will come in through the other senses as much as it will through the eyes. Your central nervous system is attuned. We all are. And these are most definitely artworks that will play people like instruments. Tags: Caleb Shea, Esther Stewart, Fiona Morgan, Johanna Nordin, Merryn Lloyd, Nick Ryrie, Renee Cosgrave. Bookmark the permalink.